"Finally, someone has documented all we know about online advertising and how to do it right. As much as this confirms that online advertising really works, we know that marketers don't always get it right. 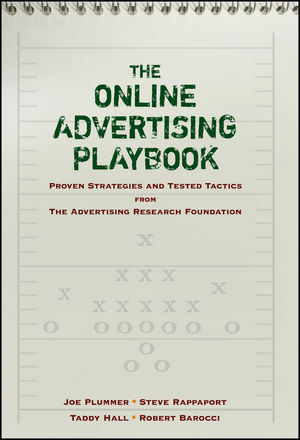 The ARF's The Online Advertising Playbook provides critical insight on what sticks and what doesn't in online advertising and marketing." "The Online Advertising Playbook's principles, case studies, and strategic insights equip marketers with the best knowledge available. It will help your online advertising achieve the full range of marketing objectives, from lead generation and customer acquisition to driving trial and loyalty." "To grow interactive marketing from here we need to institutionalize our wisdom and experience about what works. This book explains, in a disciplined way, what marketers have learned from a decade of massive change." "The Online Advertising Playbook is a milestone in the maturation of interactive advertising, but also an invaluable go-to guide for managers trying to make smart decisions with their advertising budgets." "The best marketing communication is spawned from what I call 'informed intuition.' After reading The Online Advertising Playbook, I am far better informed on how to optimize the online channel in our advertising and promotional programs. It's a perfect blend of case studies and research-backed learning." "Savvy marketers should take advantage of The Online Advertising Playbook's findings and principles to get real results." "A work of wisdom and rigor in the digital space that is as relevant for the newbie as it is for the digerati." "This is a must-read for any marketing executive involved in online advertising. It's high time that a book looks at online advertising in the context of an integrative promotional strategy, one meant to set objectives, establish creative strategies, and measure results. The book nicely ties the various components of online advertising to relevant case studies, and the emphasis on measurement and results is refreshing. Not only is it relevant for marketing executives, it would also be a good basic text for any Internet advertising course and a good adjunct to any Internet marketing course." Joe Plummer, PhD, is the Chief Research Officer at The Advertising Research Foundation and recipient of the 2006 Distinguished Marketer Award from the Academy of Marketing Science. He was previously executive vice president for McCann-Erickson WorldGroup. Steve Rappaport is the Director of Knowledge Solutions at The Advertising Research Foundation. Taddy Hall is the Chief Strategy Officer at The Advertising Research Foundation and a well-known authority in the fields of innovation and strategy. Robert Barocci is the President/CEO of The Advertising Research Foundation. He was previously president of Leo Burnett International. Growing Industry: The online advertising industry has grown to $12 billion in less than 10 years. Arguably the biggest impediment to the growth of online advertising is the absence of research-backed guiding principles. What are the right measures of effectiveness? What are the creative principles when designing different types of online ads? How can online advertisers set and allocate the right budget? How does the Internet work with other media? How do marketers select the right agency partners?